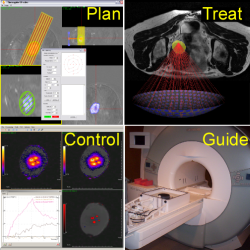 Image Guided Therapy (IGT) develops medical devices destined to the treatment of cancer. Recently, new cancer treatment approaches based on local tumor ablation have received much attention from the medical community. Thermal ablation therapy, which rely on the principle that the tumor is not removed (like in a surgical resection) but rather destroyed in place by elevating the temperature within the tumorous tissues above a lethal threshold, appears as a very promising technique for localized cancer treatment. Minimally invasive Thermal ablation procedures are particularly well tolerated by the patients and require reduced hospital stays. In this context, IGT develops patient friendly, non invasive, image guided ablation devices based on focused ultrasound (also called FUS or HIFU). volumetric ablation to ensure complete tumor destruction. Adaptive feedback to adjust treatment parameters during the procedure based on actual temperature measurements. Fast ablation through real time optimization of the heating pattern. Easy learning curve for the clinician. IGT products embody the technological choices made to comply with our four essential design guidelines and the resulting functional requirements. Thermoguide is a software destined to help the clinician monitor thermal ablation procedures with MR based temperature maps. TargetedFUS is a complete MR controlled, focused ultrasound based, ablation device. It uses phased array technology to provide volumetric ablation while retaining reliable MR based temperature images.